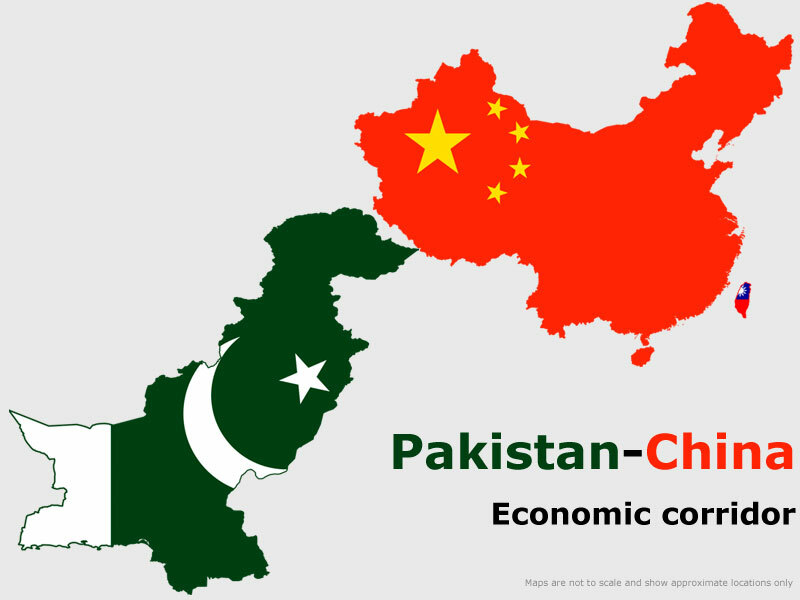 Pakistan-China Economic Corridor for regional development. Earlier this year, Pakistan and China entered into 51 memoranda of understanding (MOUs) to improve bilateral relations and increase cooperation. Of these, more than 30 covered the creation of an economic corridor that will stretch from Pakistan’s coast in the southwest past the countries’ shared border to create a new trade route. This economic corridor will help to improve the flow of goods between China and the Middle East, as well as to bring further development to western China. Much of the focus is on the coastal Pakistani city of Gwadar, whose port lies close to the Arabian peninsula and will play a large part in connecting China with the Middle East through Pakistan. The port’s facilities will be upgraded to handle an increased trading volume, and an airport will be funded for the city with the help of a loan from the Chinese government. Karachi, which also has a large port, will benefit from upgrades to the highway that connect it with the Pakistani city of Lahore, which in turn is receiving Chinese funding to expand its metro system. However, infrastructure is only one part of the plan to build the economic corridor – energy projects also feature heavily in the plans for the corridor. The energy projects span hydroelectric, solar and wind-powered initiatives, to be completed with Chinese financing and expertise. The total funding agreed at this stage is US$28bn, with a further US$17bn contingent on feasibility studies and the completion of the necessary formalities. In addition to making improvements to Pakistani infrastructure, China and Pakistan will co-chair a joint think tank to share information and perspectives between the countries to inform policymaking. There will also be research and development angles to the think tank’s work, in keeping with its name “Research and Development International” (somewhat controversially abbreviated to RANDI). Pakistan’s part of the think tank will be based at the Pakistan-China institute in Islamabad, while the Chinese arm is split between two leading local think tanks. With the improved infrastructure and trade links with China, Pakistan will be much better placed to benefit from becoming a trade route between two of the world’s largest and fastest-growing economic regions: China and the Middle East. Pipelines are another part of the development plan to channel fuel to China’s resource-intensive economy, and Pakistan’s ports will play a large part in transporting the oil from the Arab states. The ports will also distribute manufactured goods back from China to the Middle East to satisfy growing regional demand, with Gwadar approximately 500km away from Muscat and 640km away from the Straits of Hormuz. Distribution, logistics, construction, engineering and manufacturing companies all stand to benefit from the growth of this economic corridor, whether by participating in, adding to, or making use of the projects being instituted in this bilateral arrangement. Real estate will also be likely to appreciate close to key points of development, for example around the new Orange Line stops in Lahore, or where jobs will be created in Gwadar. For those foreign businesses interested in piggybacking on the Chinese-led development, investing in Pakistan involves a long, uncertain and frequently-changing process. Although the threshold of 2 shareholders and 2 directors (each of whom must own at least one share) is not particularly high, foreigners in this group require security clearance from Pakistan’s Ministry of Interior, which can take up to six months to grant approval. Although in some cases the Securities and Exchange Commission will incorporate a company in advance of the grant of security clearance, operating before this creates a risk of having the company dissolved in the event of non-clearance. Given the difficulty of the process, having experienced professional advice and project management to smooth the investment process is advisable. Healy Consultants Group PLC’ experience of setting up companies in Pakistan means that we know where the pitfalls are and how to avoid them. Thanks to the breadth of experience added by our global model, we are better prepared than most firms to spot and address potential issues before they happen, making the process faster and simpler for our clients. Contact us at to learn more about our Pakistan incorporation services.